Here is Fudge. I had to work from photographs for this one. I took some after one of her moments of sheer madness and she needed to rest - for five minutes before the next one. She's a cross between a Poodle and a Fox Terrier - a Foodle, although, as she's tee total, I think a Perrier is more appropriate. (did you see what I did there?) I have lost count of the last warnings she's been on. It's snowing here in Lincoln, the dog has now pinched the best place in front of the fire and, although smelly, rather adorable. Enjoying your blog! I am not too far from Lincolnshire (Norwich) and it is snowing here too! Oh my gosh! I concede, your Fudge looks crazier than my Yao! I am in awe of this drawing, Steven. I enlarged it and am looking at every hair (penstroke) When I grow up I want to be you! Inspired!! this is amazing of Fudge with his or her Shirley Tenple "do"----wonderful work that expresses love. I LOVE Perrier!! What a brilliant sketch!!! I wish it was snowing here in London...I miss it so much! I really enjoyed going through your posts! Beautiful art work and words:) Will definitely come back to see more. fantastic! 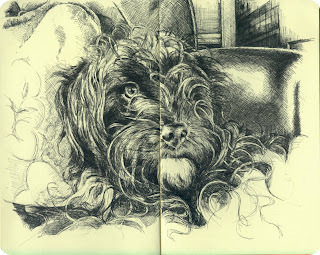 what a great sketch and doggie! This is going to be one amazing Molskine. This is fabulous. I stared at it for quite some time before i knew what to say. I just love your work Stephen! She is soo cute. What a wonderful drawing of her. Being part poodle (my absolute favorite dogs) she'll be trying to outsmart you all the time and being part terrier she'll be very active. You've got your hands full but when she settles down you'll have a very loyal friend there. Again, the hair is just amazing! And I'm glad I could help because it would have been a pity never to have seen your talent. Fabulous. Just found your blog through edm and I'm enjoying your work so much.